Cooking story with tips on how to make this quick, easy sweet. Hosh knew that mum was busy cooking for guests, so she wouldn't have time to coach him in cooking tonight. Nevertheless, after great deliberation, he decided to come into the kitchen to see if he could help Isha with anything. She smiled when she saw him, and beckoned him in. "I was just getting ready to prepare dessert," she said. "You can help me make that." "I'm going to make a really quick and simple dish, which almost all our guests love. It's Coconut balls, Nariyal laddu, that you absolutely adore." Together, they poured condensed milk into a non-stick pan. She said that they could have used a heavy bottom pan too. They added 3½ cups of coconut and mixed well. She made him cook it on low heat, stirring continuously. "Coconut is highly nutritious, and rich in fiber, vitamins, and minerals," she said as he stirred. "Nearly a third of the world's population depends on coconut to some degree, for their food and their economy." "How do you know when the laddoos are done, Ma," he asked. "How can you tell it's the right sweetness?" "Tasting a spoonful is the best way to tell if it is the right sweetness or not, and then you can add more sugar if needed," she replied, "But coconut is naturally sweet, and condensed milk also has sugar, so I tend to add no more sugar. Too much sugar isn't good for you anyway. You can tell it's done when the mixture leaves the side of the pan." Before long, the mixture was cool enough to be shaped into balls by hand. She made him grease his palms with butter. Following her lead, he rolled portions of the mixture into ping-pong sized balls. 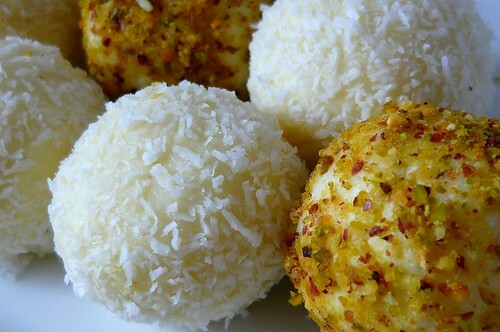 They coated the balls with leftover dry coconut powder to help handling. To add a bit of color, Isha finely diced some pistachio nuts and coated some of the balls with that. "You don't have to use Pistachio nuts though," she told Hosh, "as that will add to the cost a lot." When all the balls were made, they put them in the fridge to chill and firm their shape. Coconut balls were a hit as usual that night.